In the meadows and fields practically everywhere in the country, you'll see and hear the Great Kiskadee - a large and colorful flycatcher with distinctive calls. Here are two examples from his repertoire (does he say "Kiskadee"? 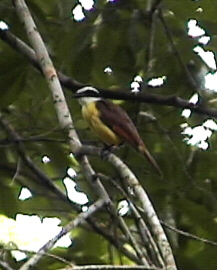 ): (1) (2) A relative of the Kiskadee and another very common bird in this fabulous country is the Social Flycatcher. They are the ones who build those nests on the phone wires everywhere (they look more like rat's nests than birds nests!). While you're wandering the fence lines and fields at the edges of the forests listen for the Yellow-faced Grassquits that like to "hedge hop" almost anywhere in Costa Rica. 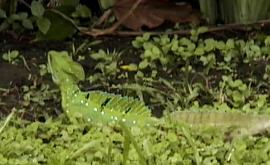 The "Jesus Christ" lizard is a Basilisk that inhabits the Caribbean slope. This one was on the lawn in Tortuguero. They're almost impossible to see if they don't want to be seen - in a tree they're pretty much invisible. They also have the somewhat disconcerting habit of running across small stretches of water, hence their common name. Some other interesting reptiles at Tortuguero are the Geckos that inhabit every building. They make a noise at night, right about bedtime, that sounds like a kiss - are they kissing us goodnight? This is all anyone saw of me during this trip. Me 'n my Telinga. This was this microphone's "maiden voyage" to such adverse recording conditions (extreme humidity, drenching rain, heat, insect repellant, sweat, getting banged around constantly, packing and unpacking). The mic performed flawlessly, to my great pleasure and relief. Most of the sounds on this page were recorded with this microphone. Any background hiss or noise is due to rain, wind, and the effect of downsampling to make them load faster. 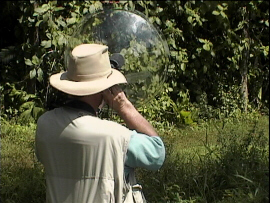 I can't say enough about Telinga - if you want to record nature, you need one. 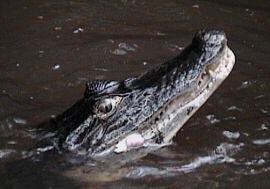 In the rivers and lagoons around Tortuguero you're more likely to see Caymans than crocs. This one was in a small tributary to the Rio Paquare. 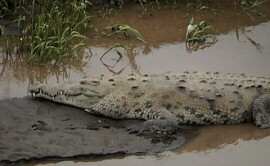 They're generally 3-5 feet long and can be "domesticated" if raised from young. They may not be crocs, but they're lightning fast and can take a hand off in a flash.